Love Vegas? Who doesn’t? It’s a magical place filled with casino after casino after casino. Step into the casino lobby (Las Vegas has some of the world’s most impressive lobbies) and you’ll feel at home. And while each property is completely different from the next, they all have common elements. For example, at every casino, you walk through a door. You’re usually greeted by a bank of slot machines. There are ATMs. There’s the cashier where you cash in your winnings. And there’s a bar or two (or a half-dozen) where you can drink, eat, and be merry. At Slots of Vegas, we’ve tried to mimic our online casino Instant Play experience so that it’s similar to what you’ll find in Sin City. If you’re new to the world of iGaming, don’t worry. We’ve got everything you need to know to feel completely at home, so read on. When you log in to your Slots of Vegas account through the web, everything is presented neatly in an easy-to-navigate tab system. You can think of each tab as a section of an actual casino, only instead of having to walk through a maze of games, you’re transported instantly to exactly where you want to be. We don’t call ourselves Slots of Vegas because its sounds great. 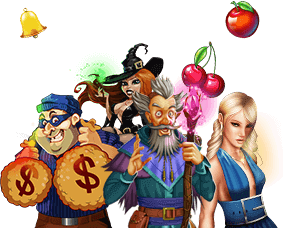 We call ourselves that because we’re dedicated to bringing you all the latest online slots. We frequently add new titles to the mix (it’s only early February and we’ve already added God of Wealth and Eternal Love to our mix, so expect dozens more titles coming your way this month). When we launch a new game, we put it under the spotlight because we want you to enjoy everything it has to offer. So all the latest titles are under New Games and they’ll stay there for a few months. At Slots of Vegas, we have a large collection of slots. Right now, you’ll find well over 160 of them, including many titles that are similar to what you play in Las Vegas. You can access all the online slots by clicking or tapping the Online Slots tab. If the game is available on the platform you’re currently on, you’ll see it here. Keep in mind that while all games are available on our Windows PC software, some games might not be available through Instant Play. So if you’re on a Mac or logging in through the web on a PC, you might not see the game you recently played. If you love table games, chances are when you step onto the casino floor in Vegas, you’re not distracted by all those jackpot sirens going off at the slots. You don’t care for the music and sound effects blaring loudly. Instead, you’re enticed by the people screaming and high fiving each other around the tables. So at Slots of Vegas, despite the fact that the word “slots” is in our name, we’ve made sure table games have their own dedicated section. You’ll find them all your favorite Vegas felt games the Table Games tab. We have Baccarat, Blackjack, European Blackjack, Super 21, Perfect Pairs, Match Play 21, Pai Gow Poker, Vegas Three Card Rummy, Pontoon, Let ‘em Ride, and more of your favorite titles. If you love Hold’em, 5 Card Stud, or pretty much any other online poker variation, you don’t need to head to an Internet poker site to enjoy a quick game. We’ve got 14 different online video poker variations to play, including Aces & Eights, Jacks or Better, Joker Poker, Loose Deuces, All American Poker, and more. If you’re missing out on the typical non-card table games that Vegas offers, don’t worry. We’ve got them here too. But instead of slotting games like American Roulette, Craps, and European Roulette under the Table Games section, we’ve lumped them under Specialty Games. You’ll also find other titles like Keno and a few other titles that aren’t really slots but aren’t really table games either. This will instantly become your new favorite part of the Slots of Vegas software. At a Las Vegas casino, you might jump from Blackjack to Roulette to a jackpot slot. Doing so requires you to walk a dozen or so yards (or even more). It’s not a big deal, but we thought we’d make things way easier online. When you see a game you like in the lobby, simply hover over it. A little star will appear at the top left. Click the star to make it one of your favorites. The game will now appear under the My Favorites tab so you can access it instantly whenever you like. Want to see all the available games in one shot? You’ll find all games—slots, table games, specialty games, and video poker—under one convenient tab. It’s an easy way to find what you want without jumping around too much. By now, you’re probably wondering how you play for real money. We’ve walked you through where to find your favorite game, but we haven’t told you how to play it. The truth is you can play any game for free. Just hover over it and click Practice to play without risking real cash. When you want to play for real, just click Real Money. The game will instantly load. If you don’t have money, you’ll be asked if you want to visit the Cashier. Click OK to be taken there. You don’t need to jump into a game to visit the Cashier, though. Above all your favorite tabs, you’ll find a Cashier tab. Just click that to head to the Cashier. It’s pretty much like heading to the cage at your favorite Las Vegas casino. From here, you can deposit using a variety of payment methods available. Keep in mind that not all payment methods are available in all locations. You can easily filter them using the dropdown. If you have winnings to withdraw or coupons to use, you can do everything right here, too. it takes just a few minutes to get into the casino lobby at Slots of Vegas. Just create your free account and we’ll let you through those doors in no time. It’s much, much faster than taking a trip to Las Vegas — and way more convenient.